When co-founder Tobias Gerhard first travelled to Kyrgyzstan, he was fascinated with the art of felting developed by Kyrgyz nomads. Back in Berlin he noticed a different type of nomad: urban nomads, with laptops and smart phones, who move from metropolis to metropolis without a fixed workplace or home. This gave birth to the idea to make the traditional crafts of Kyrgyzstan attractive to the world's urban nomads and contribute to the livelihoods of Kyrgyz artisans. Tobias together with the other co-founders Sebastian Gluschak, Oskar Kim and designer Jonas Görtz put the concept into reality with a successful crowd funding campaign in 2013. Kancha products are felt and leather device covers - for notebooks, tablets and smart phones. Recently wallets were added to the range. (Kancha means "how much?" in Kyrgyz). 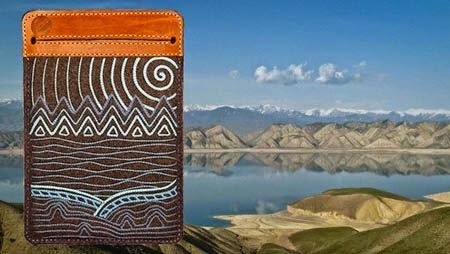 The patterns that decorate the products use Kyrgyz design fused with a contemporary twist, e.g., the burning sun over pointed peaks, lush valleys, and deep mountain lakes. The company logo is an elegant design based on a Kyrgyz tunduk – the round, central, roof element of a yurt. All items are handmade. The natural felt is dense to ensure the device is well protected. The embroidery and stitching are beautifully done and the leather is world class - remember that Kyrgyztsan is a land of nomadic traditions where livestock are plentiful and leather work has a long tradition in producing saddles, bridles and other horse tack. The covers are designed so that the device slips in and then "tucks in" under the leather flap. It cannot fall out. A cornerstone of Kancha's philosophy is a commitment to ethical work practices. Its craftsmen and women have fair working conditions, are paid on time and actively contribute to product development. Every Kancha product comes with a handmade label from the artisan who made it and you can read the profiles of the craftspeople on Kancha's website. Kancha is also committed to making a positive contribution to the economic development of Kyrgyzstan and social entrepreneurship projects. Uzbek Journeys is committed to introducing clients to the best Central Asian artisans. Kancha is one of them and a visit to Kancha is included in the Kyrgyz tours. Visit the Kancha website to watch the video about the device designs and preview the goodies before your trip. 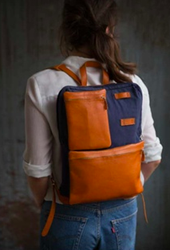 Update 29 January 2016: Kancha launched their crowd-funding campaign on Kickstarter today to produce the ultimate urban nomad backpack. The Grid is a modular backpack designed for the modern creative on the go; simple, stylish, durable and practical. Read about this cool design and the Kickstarter campaign.